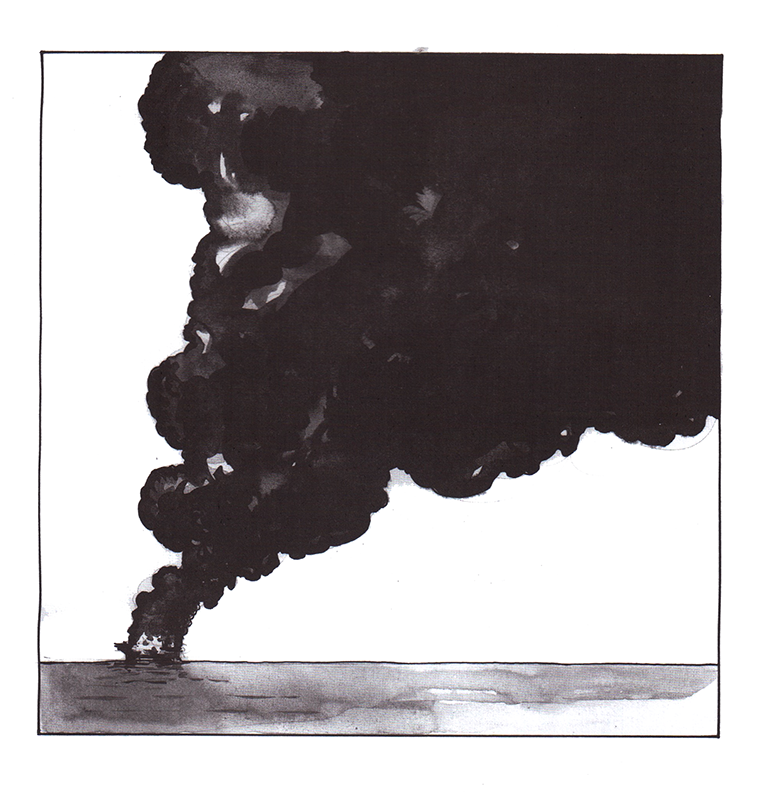 Oil and Water is a work of comics journalism exploring the impact of the 2011 BP oil spill on the coastal communities and ecosystems of Louisiana, through the eyes of a delegation of activists from Oregon. Most of us probably know some about the disaster that led to the largest oil spill in human history. The deaths of 11 BP workers aboard the Deepwater Horizon and the following 87 days of petroleum gushing unabated into the Gulf was, to a group of progressives from Oregan, the calling they needed to visit Louisiana and bear witness–to the spill, yes, but perhaps moreso the larger and deeply troubling questions it posed: What are the real effects of ecological disasters? Are these disasters avoidable? Ultimately, in a world that is quickly running out of fossil fuels, is the disaster even the root problem? Even those of us who have looked at the greater implications may find it hard to fully understand the impact of the BP oil spill without a visit to the Gulf coast. This was, at least in part, the viewpoint of the Oregon delegation, which included writer Steve Duin and artist Shannon Wheeler. Profiles are drawn of the different personalities, from their flight into Louisiana until their last day, which certainly gives Oil and Water a ‘documentary’ feel. Scenes are intermissioned by small, 4-paragraph pages detailing some of the many troubling aspects of the spill, including BP’s record of cutting corners to save costs, or the devastation of the Gulf’s sea turtle populations. 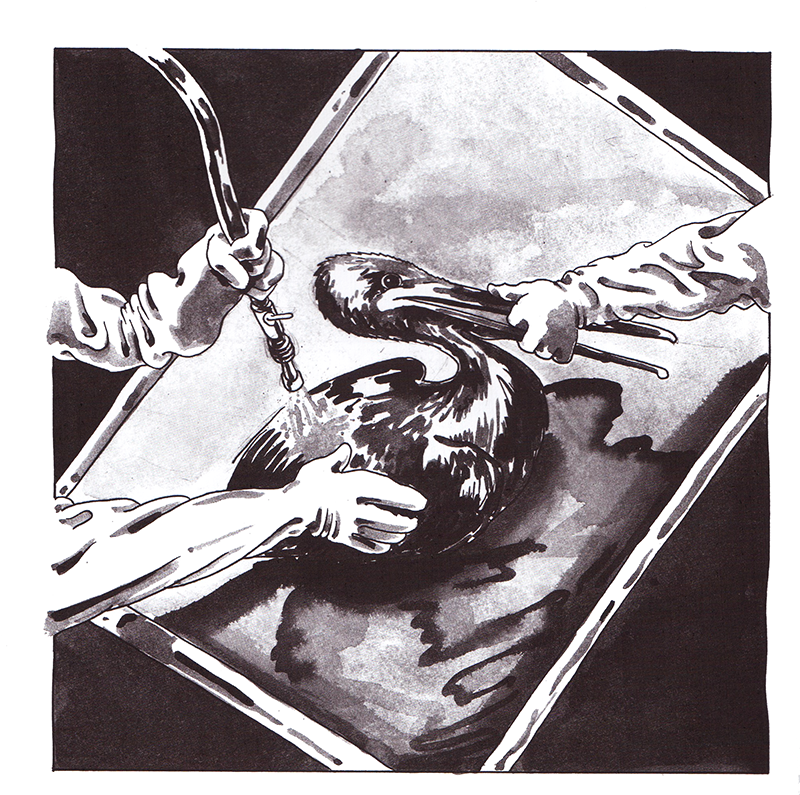 The artwork is black and white, with sketches filled in with a patchy, dark watercolour stain, certainly intended to mimic the appearance of oil. For Shannon Wheeler, an artist who is arguably known more around the world for his series Too Much Coffee Man, it struck me a bit by surprise. The art overall has a sense of haste, giving me the impression that they were rendered not from photographs but from on-the-scene sketching–something that may or may not be true. 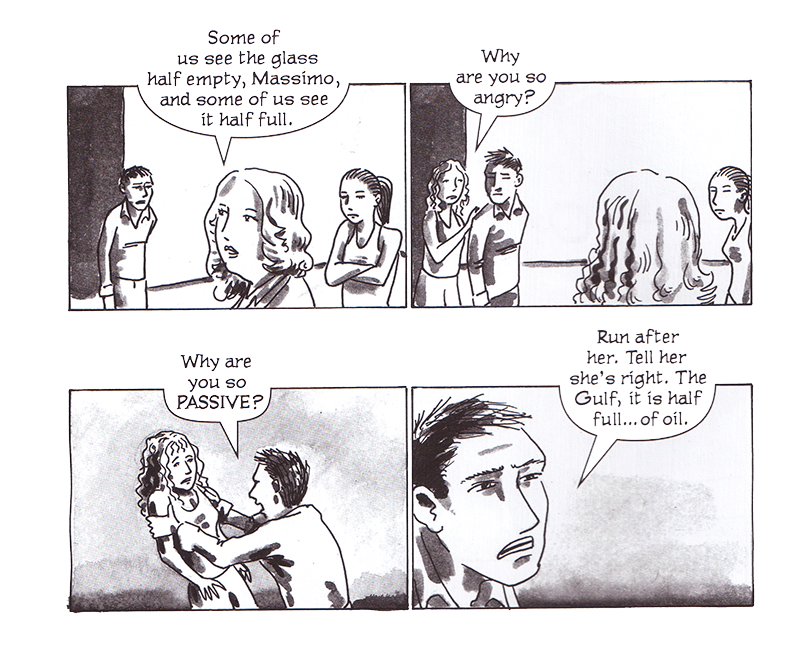 I am impressed with the changing of perspectives throughout the book. Duin seems to have really captured the thoughts and expressions of a number of trip participants and Louisiana locals, who voice their fair share of cynicism towards activists and outsiders parachuting into their neighborhood–seemingly a deja vu of the Katrina aftermath. In these sequences, we see members of the delegation change their way of seeing the world–and change their minds as to how they will act. 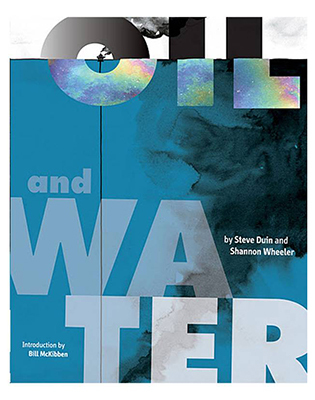 “Oil and Water” is a masterful collage of stories that, none to its detriment, only begins to scratch the surface of this tragedy. It would be a useful map of topics for someone looking for a starting point to the Deepwater Horizon disaster.